Begin your 8-day adventure with an overnight in Vancouver. Explore the sights before you depart for your two-day rail journey through the gorgeous passing Canadian landscape. The train is the perfect place to relax before your exploration begins as you can sit back and drink in the awe-inspiring scenery of the vibrant evergreen forests and dazzling lakes. Upon your arrival in Jasper, you will have time at leisure to explore the quaint town before venturing into Jasper National Park to see the unspoiled wonders of the iconic park. From the Athabasca Canadian Heritage River to Maligne Lake, the world's largest natural lake, Jasper National Park is home to an array of spectacular natural beauties and wildlife. 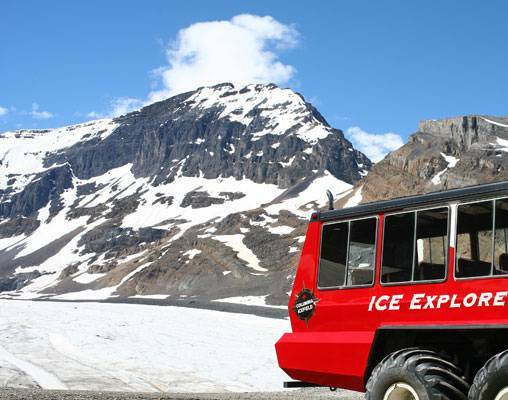 You will then travel along the legendary Icefields Parkway toward the iconic Lake Louise, but not before you have the chance to walk on a 300-year-old glacier at the Columbia Icefield. After your overnight stay at Lake Louise, you will continue on to experience the Yoho Valley. 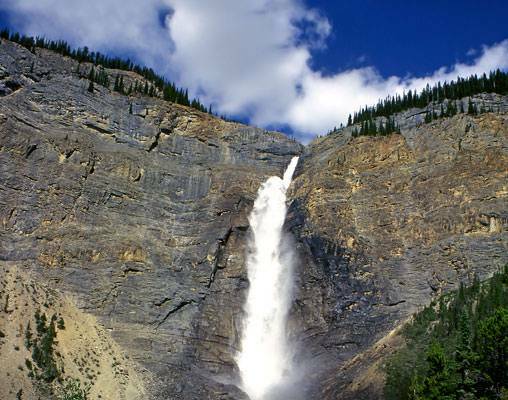 Visit attractions like Spiral Tunnels and Takakkaw Falls before continuing to Banff National Park. 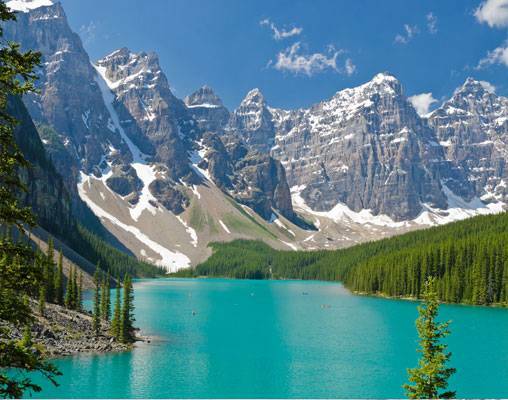 Banff is truly a visual masterpiece with emerald green lakes, ideal scenery of the Rockies, and diverse wildlife. You will have an opportunity to witness it all as you embark on a gondola ride to the top of an alpine mountain, followed by a unique boat cruise of Lake Minnewanka. You will also have time at leisure to explore the town on your own before your vacation comes to a close as you depart for Calgary for your journey home. The scenery throughout this tour is truly spectacular - and it's waiting for you! Arrive in the coastal city of Vancouver today and check-in to your hotel. Located in the heart of the city, you're central to many of Vancouver's attractions, shops, and restaurants. Take the rest of the day to explore the city on your own. Overnight Vancouver. 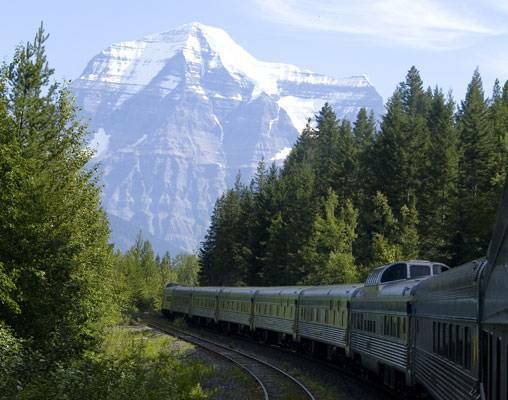 Today you will depart from Vancouver on VIA Rail's Canadian in Sleeper Plus class, bound for Jasper. (Transfer to the train station is on your own). Overnight Train. Today you will arrive in Jasper to begin a two-night stay. The remainder of the day is yours to explore the sights and shops of this stunning alpine resort town. Overnight Jasper. Experience Jasper National Park through the travels of the early explorers and view the unspoiled grandeur! This morning's excursion will begin along the mighty Athabasca Canadian Heritage River, learning about David Thompson and the valley ecosystem. Travel above Maligne Canyon, with its narrow gorge and limestone walls created by 10,000 years of water flow. Visit a place of mystery and Indian legend en-route to Medicine Lake, where sometimes it actually disappears! On the adventure to Maligne Lake, the largest natural lake in the Canadian Rockies and one of the most photographed sites in the world, you are sure to see a variety of mountain wildlife. Overnight Jasper. This morning’s tour begins with a visit to Moraine Lake and the Valley of the Ten Peaks, one of the great photo opportunities in the Canadian Rockies. Cross the Great Divide into Yoho National Park via Kicking Horse Pass, a National Historic Site of Canada. The pass is of historical significance because the main line of the Canadian Pacific Railway was constructed between Lake Louise, Alberta and Field, British Columbia using this route in the 1880s. Takakkaw Falls in the Yoho Valley will be the final stop before arriving in Banff, where you will enjoy a two-night stay. Overnight Banff. A morning excursion of Banff town site will provide you with many opportunities to view the scenic and historic highlights of the area, including a ride on the Banff Gondola for spectacular views from a one-kilometer boardwalk or 360-degree observation deck. 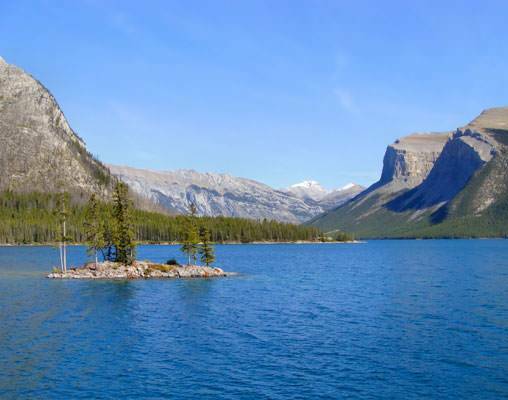 Later, enjoy an interpretive boat cruise of Lake Minnewanka*. Learn about the natural history and native legends that make this lake a landmark. Nestled in the heart of Banff National Park, Lake Minnewanka offers some of the most interesting and spectacular scenery found anywhere in the Canadian Rockies. Return to the heart of town and spend the remainder of the day taking advantage of the assortment of outdoor activities Banff offers. Overnight Banff. Your vacation comes to an end today. Transfer to the Calgary Airport is included for flights scheduled after 1:00 pm. Hotels include the Delta Hotel Vancouver Downtown, Whistler's Inn, Deer Lodge, and Banff Ptarmigan Inn. VIA Rail accommodations are Sleeper Plus Class in a semi-private berth. 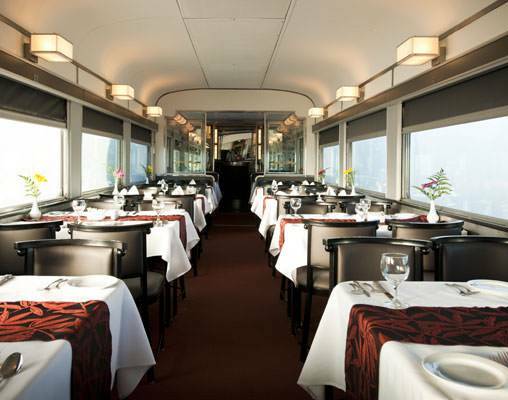 Meals are included onboard the train along with access to the Park car with its lounges and 360-degree panoramic views. Hotels include Fairmont Hotel Vancouver, Fairmont Jasper Park Lodge, Fairmont Chateau Lake Louise and Fairmont Banff Springs. VIA Rail accommodations are Sleeper Plus Class in a private cabin. Meals are included onboard the train along with access to the Park car with its lounges and 360-degree panoramic views. Click here to view testimonials for Lakes, Mountains & The Rockies. Accommodations and service were excellent. Excursions were informative and interesting. Rim Rock Hotel in Bannf was excellent. You thought of everything! Thanks for the memories. We saw so many amazing sights. The excursions were well planned out. It was nice having someone else navigate all of the sightseeing activities. Enter your details below if you would like to be notified when 2021 dates and prices are available for Lakes, Mountains & The Rockies. Prices are correct at the time of publication, however are subject to change at time of booking. Hotel and Rail accommodations listed above, are subject to change based on availability at the time of booking. Prices are per person, based on double occupancy. Taxes are not included on rail portions and are subject to change. Private transfers are available at an additional cost if flights do not fit with the schedule listed.